The growing number of Gopro gimbal on the market is further evidence that ever more people are using such kind of gadget for their Gopro. One of the last in date is Snoppa, a Chinese manufacturer which builds gimbals for smartphone and Gopro. The subject of our Snoppa Go review offers a very high-end performance and distinguish itself thanks to its silicone grip and the numerous innovative functions that you’ll be able to use. You’ll discover them all during our Snoppa Go review. This gimbal has been developed thanks to a crowdfunding campaign and the result is very convincing. Without wasting any more time, discover our in-depth Snoppa Go review in which we will look into the 6 main criteria that make it one of the best Gopro gimbal you could find. Our Snoppa Go review starts like always with the battery life of the stabilizer. We were not disappointed at all as you’ll have approximately 5 hours of running time depending on how you use it. As always (or almost) we tested this gimbal in the mountain between 23 and 28°F and it lasted a bit more than 4 hours. This is very honest when you know the effect of very cold temperatures on batteries. In the beginning of our Snoppa Go review, we were a bit surprised to see that there is only one battery…but it is a 3400mAh one. You won’t have to worry at all with it, it really does a great job. You’ll get at least 4 hours of battery life, and this is very appreciable. What we missed a bit during our Snoppa Go review was the fact that you can’t recharge the Gopro while in use. This function is offered by quite a few competitors and we always really like it. Indeed, even though you have an awesome battery with your gimbal, this is kind of useless if you have to change your Gopro’s battery every 60 minutes… The only advantage of not recharging your Gopro while in use is that your gimbal will last longer. But anyway, we would rather have recharged our Gopro during our Snoppa Go review. What you may do, though, is recharge your gimbal while in use with an external battery. Even though we did not use it during our Snoppa Go review, it may be interesting in some specific situations. If 4 or 5 hours of battery life for your Gopro gimbal are not enough, you can always bring an external battery with you. In the end, our grade in this section of our Snoppa Go review is 9.5/10. In the next section of our in-depth Snoppa Go review, we’ll look into the quality and reliability of this stabilizer. Before we even started our Snoppa Go review, we already knew it was going to be a good test. And for good reason, it is delivered in a very good box which directly makes you confident about the quality of the product. Once unboxed and tested, we were just a bit disappointed, but nothing you should worry about. Indeed, as far as the grip and the structure are concerned, there is nothing to say, everything is good. We can add a special note for the silicone grip and the aluminium structure that we really enjoyed during our Snoppa Go review. The quality is there and we had nothing to complain about as far as this is concerned. Furthermore, we can also note that the grip is really light (only 0,65lbs / 295g without the battery and Gopro) which makes it very easy to use. We will come back more precisely on this point at the end of our Snoppa Go review. Further evidence of the quality of the product, it can work under temperatures between 14 and 140°F. We have never seen such a large temperature allowance. Yet, we don’t think that there will be someone who would use it under 140°F, but we never know… As we already said in this Snoppa Go review, we used it under 23 to 28°F and everything was working perfectly. The point we criticize is not the quality, but the reliability, which are two different things according to us. In fact, it happens that sometimes, the algorithme has a few bugs and that makes the motors react strangely. This will considerably affect the quality of the stabilization and the shots won’t be that smooth when this happens. Yet, don’t worry, this bug only happened twice during our Snoppa Go review which lasted more than 4 hours. Since, we have used it quite a few times and we never had this bug again. Maybe it was only a problem with the update of the software. Indeed, you can do updates of the software very often and very easily thanks to the micro USB port which is on your gimbal’s grip. From now on, the last updates seems to have fixed the bug we met during our Snoppa Go review. In the end, our grade for this section of our Snoppa Go review is 8/10. As we’ve seen, everything is ok for us regarding the quality of the product. Yet, the reliability can sometimes be a bit instable. As we’ve shown, if the software is not up to date, there may be some little bugs in the algorithme which make your motors work badly. In the third section of our Snoppa Go review, we will present you the quality of the stabilization of this Gopro gimbal stabilizer. This section of our Snoppa Go review is of course very important. Indeed, the thing people who are looking for a Gopro stabilizer are looking for is definitely the stabilization, of course ! As far as this is concerned, we were very pleased during our Snoppa Go review by its performances in terms of stabilization. The videos are very stable and smooth and it perfectly reacts to our moves. Thanks to its 5 ways joystick, you’ll be able to adjust the shots angles with a perfect accuracy. In fact, the joystick works very well and its speed will depend on the “strength” with which you’ll push it. As we’ve just seen in this Snoppa Go review, the only weakness appeared during the little bug of the algorithme, but now, this is fixed ! When it works well (when there is no bug), you’ll have one of the best stabilization on the market. Even though it’s not as good as the stabilization of the Removu S1, the Gopro Karma Grip or the EVO GP PRO, this is still very convincing. In the end, we graded it with a 9.1/10 in this section of our in-depth Snoppa Go review. As you’ll see in the next section, there are plenty of different ways to shoot videos with this gimbal stabilizer. No matter the one you’ll choose, the outcome in terms of stabilization will be very good. Without wasting any more time, let’s have a look at the real strength of the subject of our Snoppa Go review : the functions. The hobby horse of this gimbal is really its functions. Indeed, as you’ll see in this section of our Snoppa Go review, you won’t lack anything as far as the functions are concerned. What is really interesting is that this stabilizer has some functions you won’t find with any of its competitors. Where to start ? The first thing that we really enjoyed during our Snoppa Go review is the fact that there is a light around the joystick which indicates you in which mode you are. Even though this is a pretty simple function, this doesn’t exist with the other competitors’ gimbal and we truly enjoyed it. This is very useful ! You’ll always know in which mode your are and what is the level of the battery you have left. This is definitely something we liked during our Snoppa Go review, and, according to us, the competitors should really include this in their future gimbals. Concretely, the green light will be switched on by default and that means that you are in Pan Track Mode. The circle around your joystick will be red if you switch to Lock Mode. Finally, it will be yellow if you are in Full Track and Underslund Mode. We’ll see in the next section of our Snoppa Go Review what are exactly these modes. You’ll see, it is very close to what all the other competitors offer. Well, this was the first (of a long list) function we really enjoyed during our Snoppa Go review. This 3 axis Gopro gimbal will also enable you to control your camera directly from the grip thanks to its backpack that you’ll fix on your Gopro. This is unfortunately only available for your Gopro Hero 4 (but it is included in the package for free). Unfortunately, you won’t be able to use it if you own a Gopro Hero 3…which is a shame according to us. 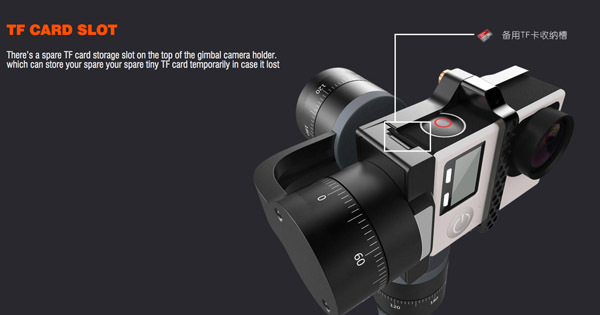 As far as cameras are concerned, note that this gimbal is only compatible with the Hero 3 and 4. If you own the Hero 5 Black, then, you’ll have to turn to the Removu S1, the Feiyu G5 or the Gopro Karma Grip, to name but 3. Yet, if you own the Hero 4, then, this gimbal is really perfect. Indeed, we did our Snoppa Go review with this camera and we really enjoyed the fact that we were able to control our Gopro directly from the grip. You’ll be able to switch ON and OFF your videos and, when you’ll switch your gimbal off, the camera will automatically turn off. The same goes for when you turn your gimbal ON, the Gopro will switch ON and start shooting video automatically. This is a real asset we truly enjoyed during our Snoppa Go review. As if all these was not enough, the Chinese Gopro gimbal manufacturer also included a storage space where you can stock a second SD card. This is very useful if you are planing to shoot for a whole day. Indeed, the SD card is really something you can easily lose. Here, you’ll have no trouble finding it once your SD card which is in your camera is full. 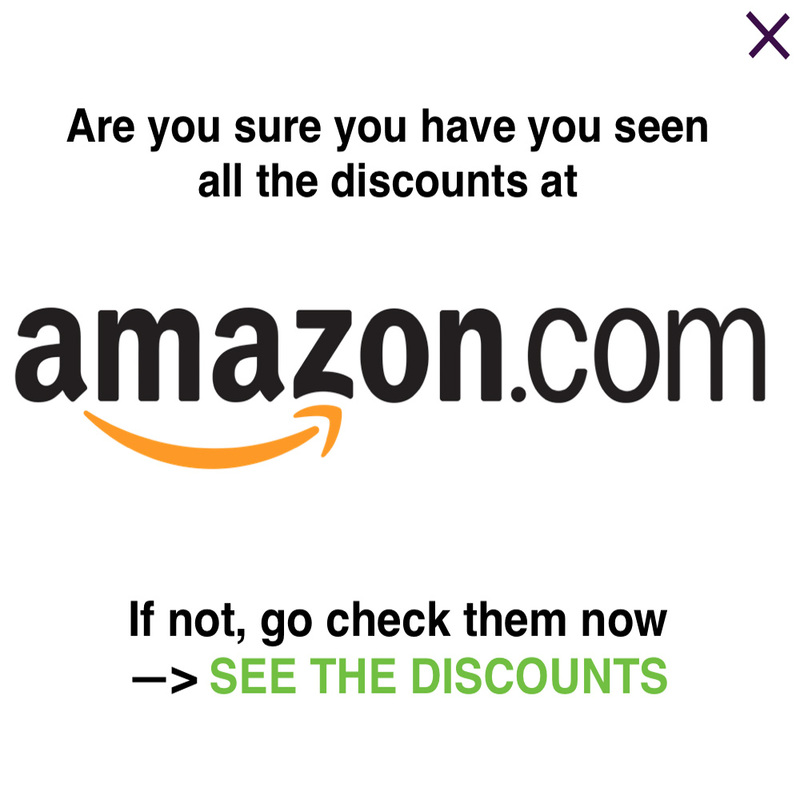 This is very useful and we can only appreciate that in our Snoppa Go review. Well, we’ve seen the main functions of this awesome Gopro gimbal. Our grade for this very good section of our Snoppa Go review is 9.5/10. We didn’t give it a 10/10 because it can work with only a few cameras. Furthermore, it lacks two options we would have liked to see with this product. These two functions are the fact of being able to separate the stabilizer from the grip and the water resistance. These functions are available with the Gopro Karma Grip, the Ikan Fly X3 Go or the Removu S1 for the separation and the Feiyu G5 and Removu S1 for the water resistance. Despite these 2 functions we missed, there are still plenty of functions to enjoy here and they mattered during our Snoppa Go review. The next criterion of our Snoppa Go review will be about the taking in hand and the controlling of the gimbal. The taking in hand and controlling is the 5th criterion of our Snoppa Go review. As far as this is concerned, we were very pleased with the silicone grip which offers a very nice comfort. Even though it is maybe 1 or 2 inches shorter than what we would have expected, it really offers a good comfort of use that you won’t find with the competitors’s gimbals. Furthermore, as we said earlier in our Snoppa Go review, it is extremely light and you’ll be able to use it for hours without having any pain with your arm. The taking in hand is therefore a very good asset that we truly enjoyed during our Snoppa Go review. Regarding the controlling, one more time, everything works easily and perfectly. The balancing is made automatically and you’ll manage to start shooting very swiftly. We’ll now come back on the different modes of the gimbal we talked about earlier in this Snoppa Go review. The default mode is the Pan Track Mode. This enables you to keep the horizon steady and you’ll be able to adjust it thanks to the perfectly-working joystick. By hitting the joystick once, you’ll switch to the Lock Mode which sticks your camera in one direction. No matter the moves you do, the Gopro will always keep your target in sight. This mode really pleased use during our Snoppa Go review even though it’s not the most useful according to us.. If, for instance, you are moving and you want to keep your target in sight, then, the Lock Mode is the one you need ! Finally, if you hit the joystick twice, you’ll turn into Full Track and Underslund mode. 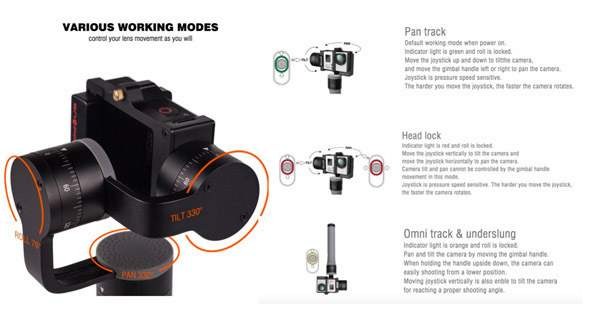 This one enables you to do perfect follows and your gimbal will do exactly what you do. If you turn your gimbal upside down, you’ll be able to do low shots which brush past the ground. This is something very well designed that we liked during our Snoppa Go review. 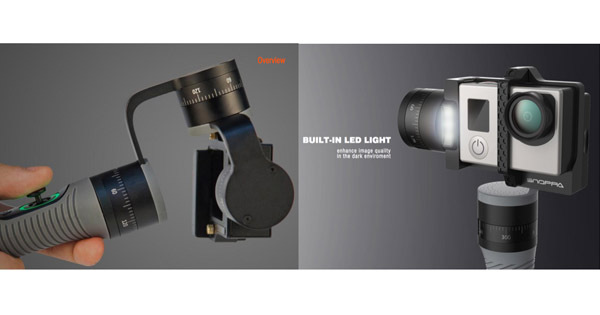 Finally, if you keep your finger on the joystick for 1.5s, this will switch ON the LED in front of your gimbal. Everything is really simple and works perfectly. 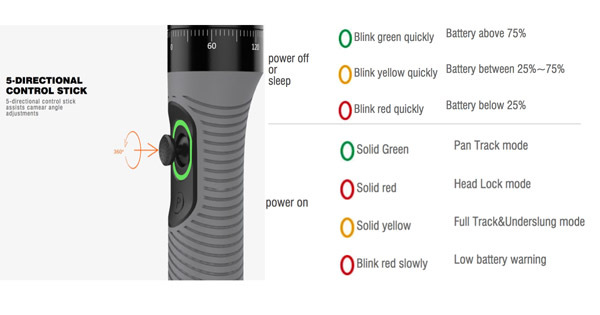 You can also have an easy monitoring of your battery life according to the color of the flashing light. If it flashes in green, you’re between 75 and 100% of battery life. If it’s yellow, you’ll have between 25 and 75%. And, if it blinks red, then, you have less than 25% of battery life, that means you’ll have to change your battery soon. This perfect monitoring of your battery life really pleased us during our Snoppa Go review. The point which disappointed us a little during our Snoppa Go review is the fact that there is no mobile application for remote control. 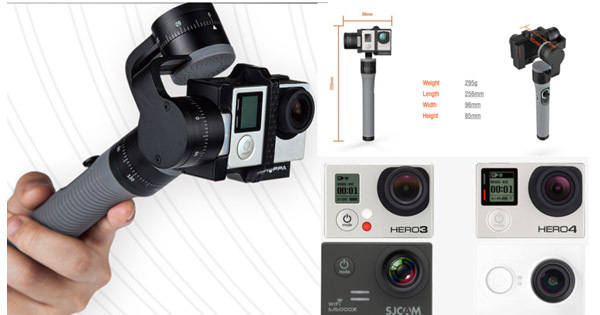 Still, there is plenty of accessories you can purchase with this Gopro gimbal in order to have this remote control. Unfortunately, these are not included in the pack and you’ll need to buy them separately. All in all, that makes a grade of 9.4/10 in this section of our Snoppa Go review. Everything has been very well designed in order to have the user have the best possible experience with his stabilizer. We also need to mention the fact that, if you own a Hero 4, then, this is the perfect combo for an easy controlling. Without wasting any more time, discover the conclusion of our Snoppa Go review on the price of the product. Here we are at the conclusion of our Snoppa Go review. All these very interesting performances will be accessible for less than 250$ . This price is quite competitive even though it’s maybe slightly over its “fair price”. Therefore, we graded it with a 8.9/10 in this section of our Snoppa Go review. The quality/price ratio is really good with this stabilizer which currently ranks on the podium ouf our Gopro gimbals ranking. It’s way cheaper than the first gimbal of our ranking, the Removu S1, but still more expensive than the Zhiyun Evolution or the Feiyu G4S which are sold about 200$. Just below, discover the summary of the Pros and Cons we have presented during this in-depth Snoppa Go review. Pros : The price, the battery life, the numerous innovative functions, the stabilization, the easy taking in hand and controlling and the quality of the product. Cons : The reliability, the limited number of compatible camera sand the lack of mobile application. Well, we have to admit that our Snoppa Go review was an unexpected real pleasure ! With a grade of 9.1/10 it is really part of the best Gopro gimbal stabilizer you may find for the time being. The quite little Chinese company really did a great job and that’s why our Snoppa Go review was that cool. Thanks to its innovative functions, it will certainly please many of its users.